By Meredith Chilson on January 5, 2013 Visit Meredith's Website. by Meredith ChilsonIt’s probably no secret that I’m a bird lover. I have several backyard bird feeders, am often found slowly cruising summer back roads looking in shrubs for nests or even occasionally can be caught standing in my yard staring at the sky following the flight of a raven or the call of a pileated woodpecker. And—well, then there are the chickens…. This time of year, when cold, snowy days keep the chickens close to the coop, I like to supplement their feed with a few energy-filled treats. I also like to make sure the girls have something for entertainment, to keep them from picking at each other. While I was preparing suet treats for my backyard feeders this past week, I thought I’d make a large cake of similar ingredients for the chickens. According to the Cornell Ornithology Lab’s “All About Birds”site: Suet is technically defined as the hard fat around the kidneys and loins in beef and mutton, but in common usage, most kinds of beef fat are also called suet and can safely be fed to birds….Animal fat is easily digested and metabolized by many birds; it’s a high-energy food, especially valuable in cold weather. I use suet as the base for my winter backyard bird-cakes, I have occasionally fed my chickens small pieces of animal fat, and I know they are omnivores. We just received our winter’s supply of locally grown beef, and part of the order included suet, too. I “rendered” the suet by cutting it into small chunks and melting it over low heat in a heavy kettle. 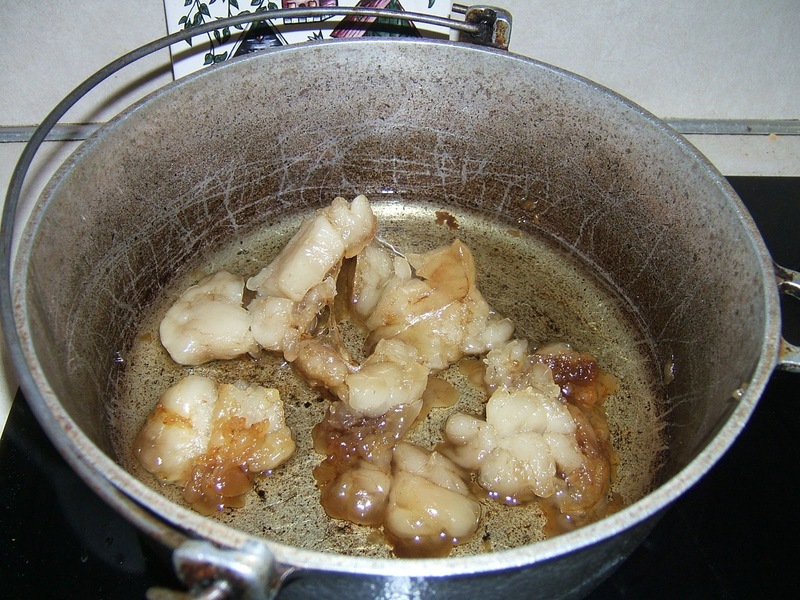 This step took about two hours, because I was very careful not to let the fat burn, but just liquefy. When I make this recipe for the backyard birds, I am very careful to strain out any pieces of meat. I think, however, the chickens might enjoy a few crispy pieces of meat scrap! While the fat was melting, I lined a bread pan with waxed paper, and added the rest of the ingredients to a large bowl. The general measure I used was this: for each 1-1/2 cup measure of liquid fat, add about 5 cups of cereals, 1-1/2 cups of seed, and ¼ cup peanut butter. I used oatmeal, breadcrumbs, cornmeal and whole wheat flour for the cereals and scratch grain for seed. I also added a handful of dried cranberries. I stirred the peanut butter into the hot fat, poured it over the dry ingredients in the bowl and mixed well. The “batter” was then placed in the prepared pan, firmly patted down, and left to cool overnight on a rack. In the morning, I removed the cake from the pan and peeled off the waxed paper. 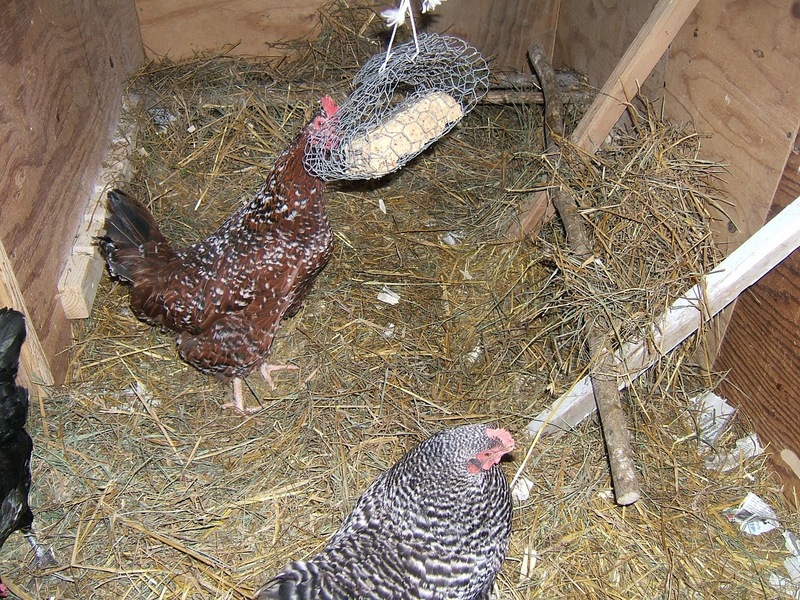 Over the years that I have been chicken keeping I have tried various “seed blocks” in the winter coop. I’ve found that the hens will spend some time pecking at a block when it is first introduced and then only occasionally work at it. I have never been able to figure out a good way to hang the large blocks, and the girls end up making a mess of them and on them when they are just left on the floor of the coop. My idea was for this Chicken Cake to hang, or swing, from the ceiling, somehow, so the girls could peck at it for entertainment while getting a nutritious, high-energy treat. I clipped off a section of chicken wire from the end of a roll I had saved. Then, I wrapped the wire around the solid, cooled cake. I used the heavy cord already tied to the rafter in the coop (left from last season’s extra feeder), threaded it through the wire cage, and let it swing. The girls had been standing on my boots while I tied the cord, and as soon as I let the Chicken Cake in a Cage swing freely, they were pecking at it. Success! It was a fun project –very inexpensive as I used ingredients and wire I had on hand. I always like to find something I can make at home to give to the girls as treat—this is entertaining as well as nutritious! 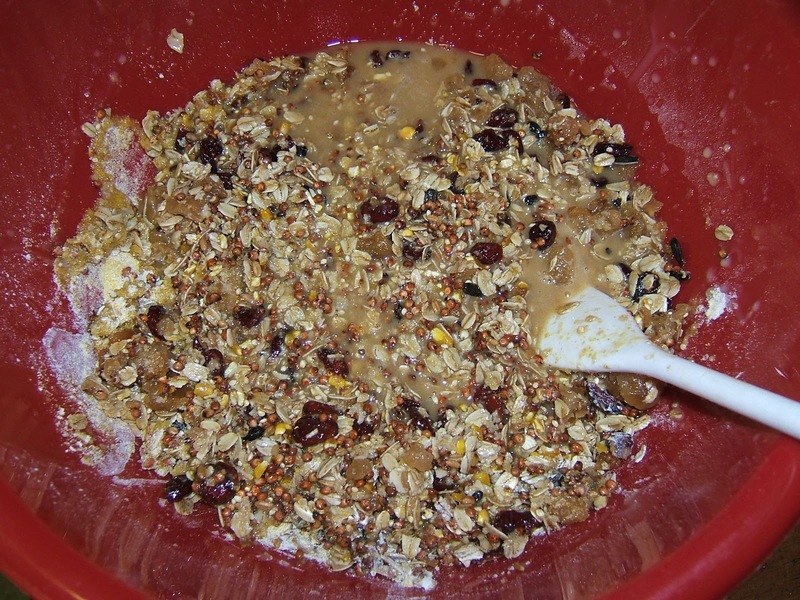 If you’d like to read about the treat I made for the wild birds, CLICK HERE. thoughts about using bacon fat instead of suet? I was considering making a “cake” for my chickens too, but I wasn’t going to use suet. I was basically going to use a cornbread recipe. The one main ingredient I plan to incorporate is the powder left over from the pellets I buy. I always put their pellets through a sieve before I put them in the feeder and sometimes I get a lot of powder and crumbs. Often I use that to supplement the feed I give the mealworms I raise. But I was also envisioning making a “cake” with that waste, whole wheat flour, oatmeal, bound with a couple of eggs and some milk. Any suggestions of what I should or should not put in it??? If I kept my chickens inside when it was only 20 above, they would never go outside in the winter. I have a small heater in the coop, but open the door so that if they want to go out they can. I also scatter straw on the ground where they will first step out. They come out for the sunshine the goodies that I throw out there. I know when it is really cold (20-30 below) they will just sit in the doorway or at the south facing window and soak up the sunshine. It’s often colder than 20 here, too. I’ve done the same with the “teaser straw” just so they’ll step out. Usually as long as there’s no wind, my hens will go out on it (but not directly on snow). if the sun is shining, often they are even “bathing” in the litter in the sunny spots on the coop floor. I put my flock block in a old crisper drawer(metal) on the floor it contains any mess. My chickens never get tired of picking at it. This winter my chickens have been outside roaming around more then ever the temps have been cold but with no snow they come out. It never the temps that keep them in it’s snow. They also don’t like to go out when it’s windy. Same with mine. Cold days, they don’t mind being outside, but snow and wind–nope, inside by the fire (if they had one). That’s a good idea for keeping any mess from the flock block contained. 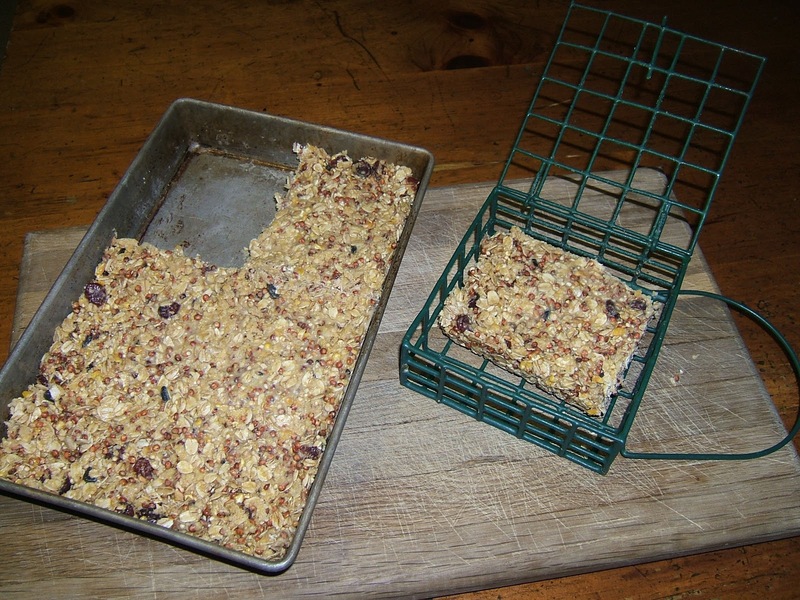 I do make suet for my wild birds then freeze it in the plastic suet cake trays that have been purchased from stores to be put in the wired square cages. 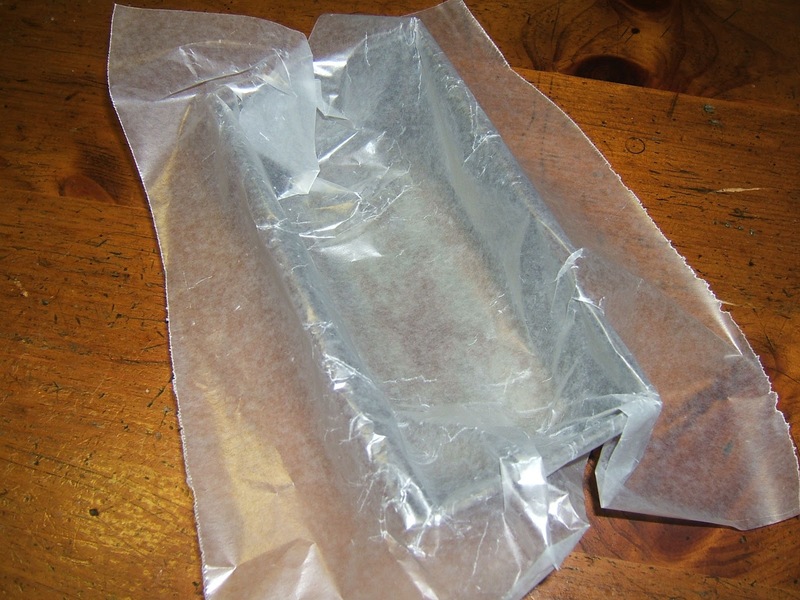 When I have filled all the plastic trays, I freeze, then take them out of the plastic trays for another time making suet.I wrap each cake in a flip top sandwich bag and then store in a 2 gal. bag in the freezer. I can get 14 cakes in a 2 gal. bag. 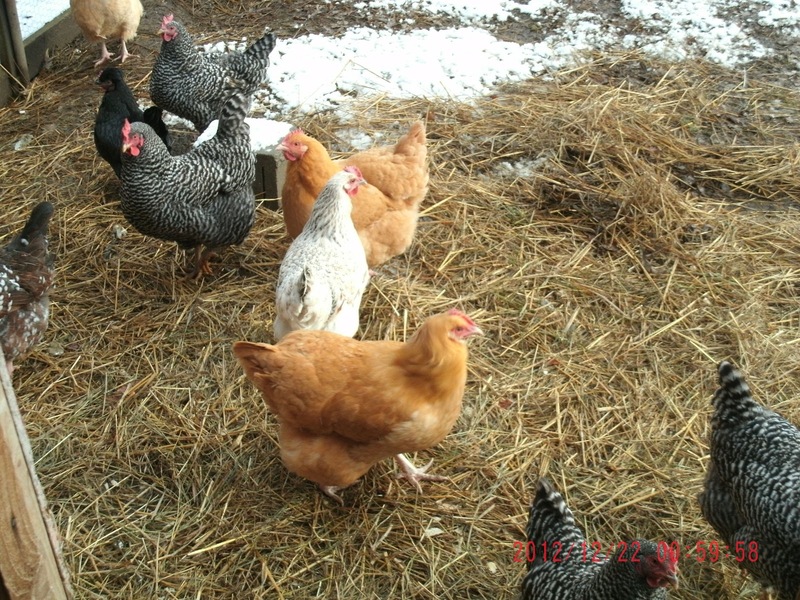 With my chickens, I would make a special suet cake of cracked corn, rolled oats, some scratch grains (I say that because if I feed my chickens just scratch, the egg production goes down drastically)any old nut meats, peanut butter, cranberries, raisins and some rendered suet from pork fat. It does give the chickens something to do on cold days. When temps are 20 degrees F. or more they are outside! They need the sunshine to help with the egg production and it helps to keep some…of the excrement OUTSIDE! Good way to reuse the plastic trays! I’m always looking for ways to reuse or recycle things. I agree that just scratch isn’t great–it’s like candy, and they’ll eat that and not much else. 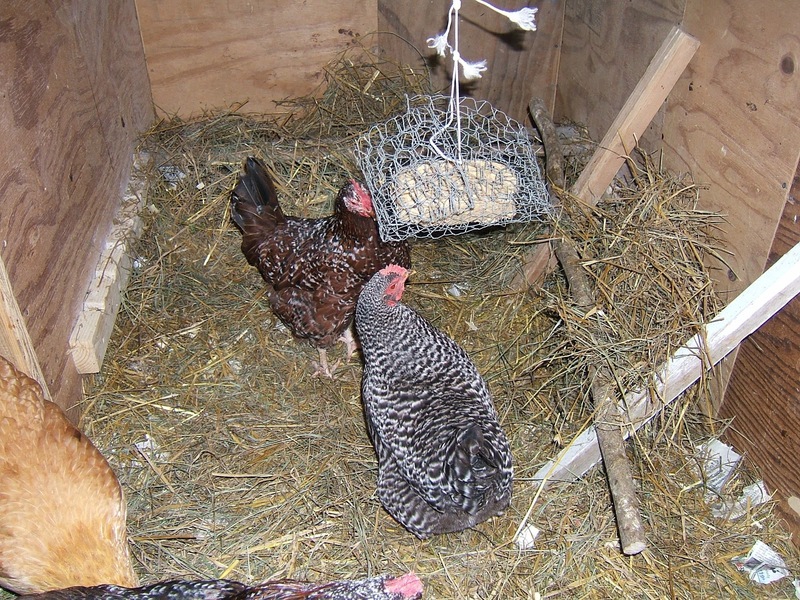 I hang my “cake feeder” high enough so they have to swing it a bit and work at it, and on snowy days even if it’s not terribly cold, the girls often don’t like to leave the coop. I hang Purina Flock blocks with a horse hay net. Cheap and works great. 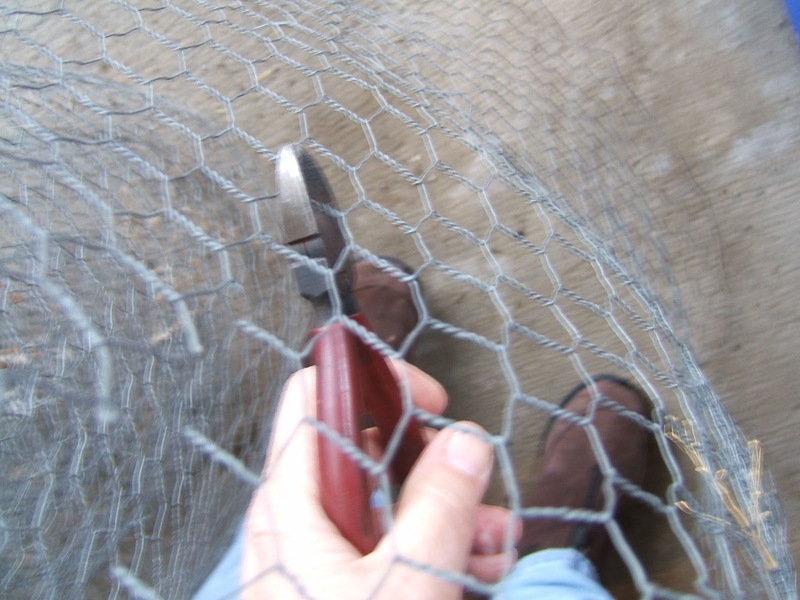 Much easier than dealing with chicken wire. I think that’s a great idea for hanging the flock blocks. I used chicken wire because I had it! And, the suet-seed cakes I make are much smaller than the flock blocks, so it wasn’t hard to wrap it. Good ideas–and cayenne pepper? I know that’s supposed to keep squirrels away from bird feeders, but I hadn’t heard of using it for chickens. For backyard birds, why is it important to strain out any pieces of meat? Great question! I don’t have an exact answer for you, although I know that it’s very important to have the impurities strained out of the suet for backyard birds. If you find a better answer, I’d love to hear it! Great post Meredith! I’ve made my own suet for years and I have more luck attracting bluebirds to my homemade variety than purchased suet cakes (homemade always tastes better)!– I’ll have to try your chicken version!